Although an employee has the responsibility to follow guidelines and conduct work safely, the company has a legal obligation to protect its staff. The handling of chemicals is a hazardous task that has caused environmental accidents and worker injuries. Transferring a chemical container to avoid spills presents one set of dangers; pumping from one container to another more so. Safe Work Australia provides a comprehensive guide to Codes of Practice and regulations for a safe working environment. In May 2012, a serious incident occurred when two workers were transferring chromic acid from one container to another. During the operation, the outlet hose of the pump dislodged and sprayed acid over the staff and into their eyes. Apart from the hose not being checked to make sure it was adequately fixed to the pump, the workers involved in the accident had no proper training in operating the pump, inadequate supervision and no safe operating procedures to follow. Furthermore, they had no personal protective equipment (PPE) or emergency guidelines to manage a chemical exposure injury. Recommendations from the government’s accident investigation report included the development of procedures and to provide training. The objective is to ensure workers know how to safely operate, clean and maintain pumps and the use the correct PPE. Although problems can be avoided through proper procedures, choosing the right pump for the job may avoid a dangerous situation arising. When selecting the correct pump, qualified suppliers should be able to provide information to help you decide. Analyse the workspace and existing piping system to provide the layout and identify the function of the pump. Aspects to consider include the fluid characteristics, the piping system used and the regularity of output. What steps are required to make operations free from leaks and what is the chemical compatibility of all wetted parts? Also, consider how safe and easy the pump operates and the safest location to install it. Pumps are used to transfer a number of hazardous liquids, including flammable, toxic and corrosive chemicals. For best practise in operating safety, the operator needs to be aware of the potential risks and avoid them from increasing into an emergency. Potential hazards from pumping chemicals include leaks from broken seals, flow reduction in centrifugal pumps, too much pressure and excessively high temperatures. Deadheading is a problem when the discharge from the pump closes due to a blockage or a closed valve. The pump will shut down, re-circulating the fluid and causing overheating. Backflow happens when the motor stops leading to possible fluid overflow. The sealing of the shaft in the rotary lobe, gear and vane pumps stops contact between the rotating shaft and the pumped fluid. Gland packing is a common type of seal; a stuffing box is placed where the drive shaft enters the housing connection. It is filled with packing material and compressed to provide a liquid-tight seal. Magnetic centrifugal pumps are seal-less as the impeller and pumped liquid are both contained within airtight housing, so do not require packing or a mechanical seal. 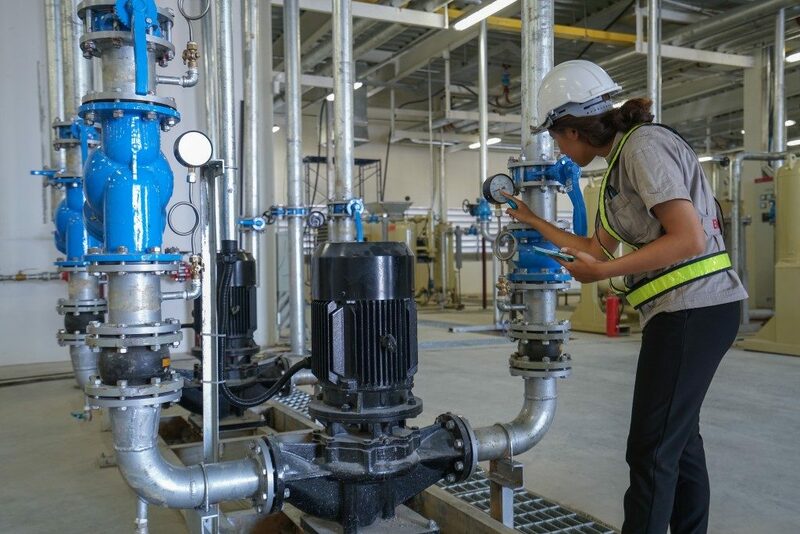 Pumps provide a vital role in industry, and technological advances have improved both their efficiency and safety. However, without the proper consideration of the best pump for a specific job, and implementing basic operating procedures, hazards will remain unnecessarily high.